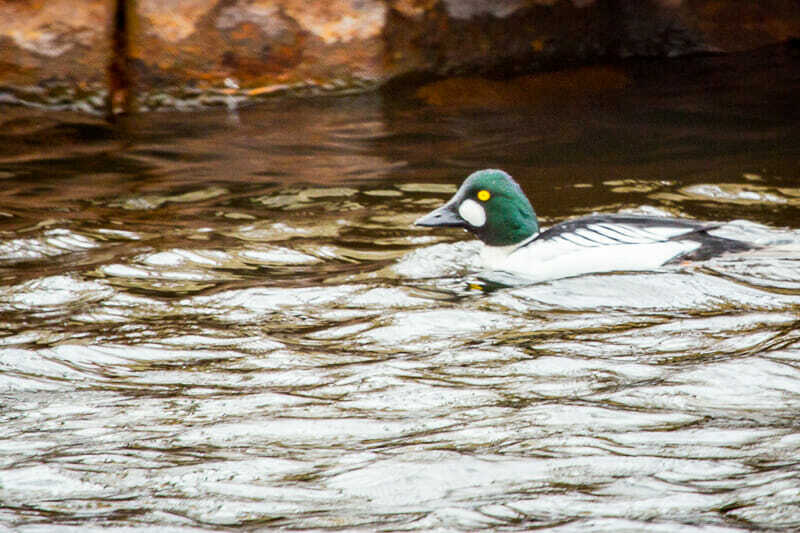 Lake Mitchell and Lake Cadillac – Once the ice goes off the lakes in late March or early April, until mid-May hundreds of migrating waterfowl will stopover in the lakes. When it’s windy, look for birds on the lee side, usually near the west shore.  On Lake Cadillac try viewing birds from the M-115 Causeway, Mitchell State Park, and along North Boulevard to Kenwood Park. Birds in Lake Mitchell can be seen from the public boat launch on Little Cove and along the shore of Camp Torenta. During the summer eagles, great blue herons, and Canada geese can be seen anywhere near the lakes. Beginning in October and continuing until freeze up in December, migrating waterfowl will again stopover on the lakes as they fly south. White Pine Trail, Cadillac to Tustin – This fifteen miles of paved trail offers a variety of terrain ranging from fields to forests to wetlands which attracts a mixture of feathered fowl. While short stretches can be walked, a bike tour on the trail, with frequent stops for viewing, might even be better. Look for warblers in wooded stretches in spring. The wetlands draw teal, mallards, wood ducks, and ring-necked ducks as well as green and great blue herons. Spring and fall are the time to see killdeer, common yellow-throats and tree swallows in the marshes. Watch for meadowlarks, bob-o-links and dickcissels in the grass lands. If you could pick only one area, drive to Tustin and walk for a mile or so north. Wetlands can be found near 48 Road and US 131 crossings. 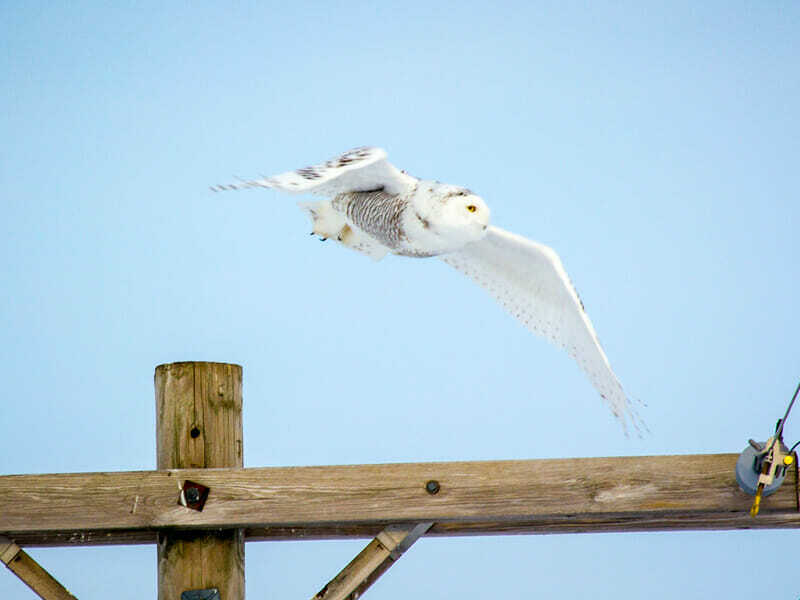 McBain – March-April is prime time to see snowy owls, sandhill cranes, rough-legged hawks and American kestrels in this mix of farm and wetlands. Start three miles east of McBain near Wayside Chapel where M-66 curves south. Continue east and south on farm roads (DeYoung, Brinks, Meyering, VanderMeulen Etc). Be careful, the dirt roads can be muddy! Watch for owls or hawks perched on fence posts and telephone poles. 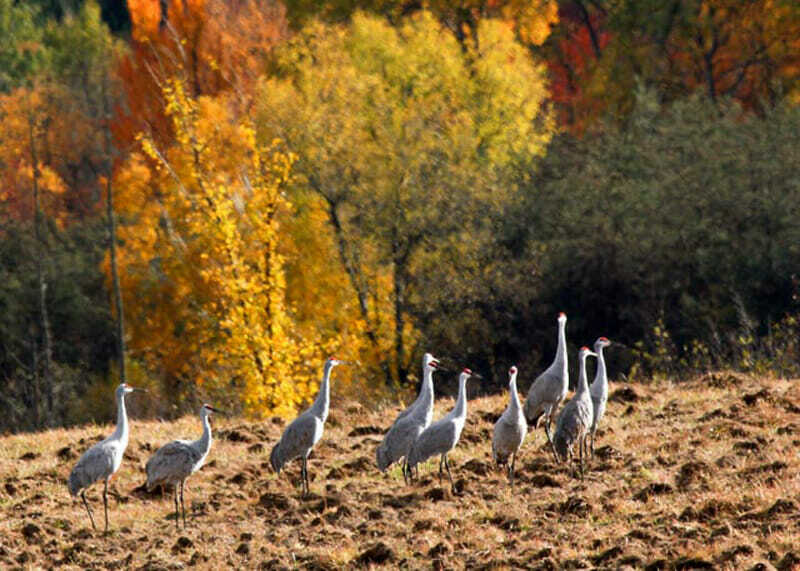 Groups of sandhill cranes can be seen feeding in fields. Carl T. Johnson Hunting & Fishing Center Nature Trail – The “Carl T.” is located at M-115 and North Boulevard across from the Canal. The trail is 2 ½ miles long with stretches of boardwalk and includes both woodland and wetlands. Look for “dabblers,” American bitterns, common yellow-throats, thrushes, and tree swallows in spring-summer, plus nuthatches, chickadees, and brown creepers in the woods. Be sure to visit the Carl T. Johnson Nature Center which features taxidermy mounts and dioramas of birds, fish, and animals. The “Carl T” trails can also be reached from Kenwood Park off North Boulevard. Kenwood Park has a less defined trail system through the north end of the park. Manistee River – Birders can access the Manistee River from Baxter, Glengary, and Red Bridges, as well as Tippy and Hodenpyl Dams. 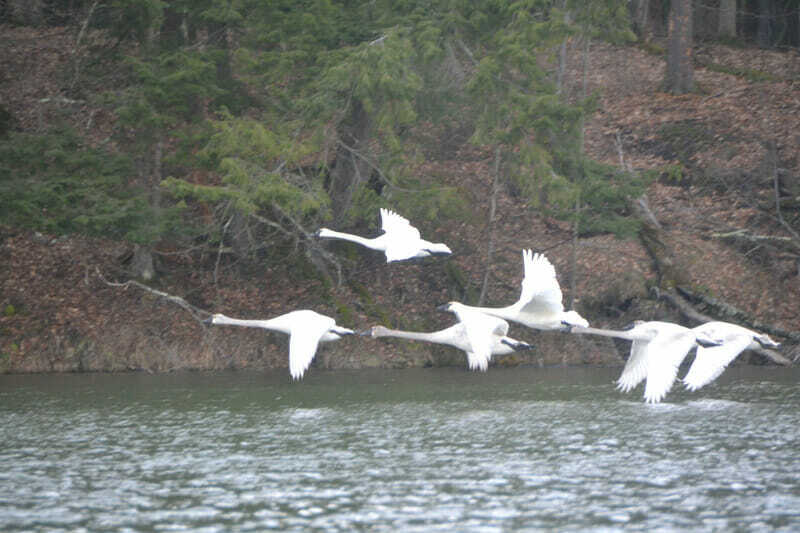 In the winter and spring this watershed attracts trumpeter and tundra swans as well as eagles and red-shouldered hawks. There are several active eagle nests in the area. From spring until fall look for kingfishers, swallows, dabblers, red-shouldered hawks, in addition to various water-thrushes and woodland thrushes. All of this water is easily paddled by canoers and kayakers, which may offer an even better view. Sleeping Bear Dunes National Lakeshore and M-22 – Only an hour’s drive from Cadillac, thousands of acres of Lake Michigan public beach spanning the length of this National Park provide exceptional viewing of migratory flyways. In addition these beach lands are home to endangered piping plovers. To help birders, the Sleeping Bear Birding Trail is being developed. Current information can be found at www.sleepingbearbirdingtrail.org. Anywhere along the 123 mile length of M-22, which outlines the Leelanau Peninsula, there are birding opportunities, along with diverse habitat, plenty of public access, and miles of shoreline beaches to explore. 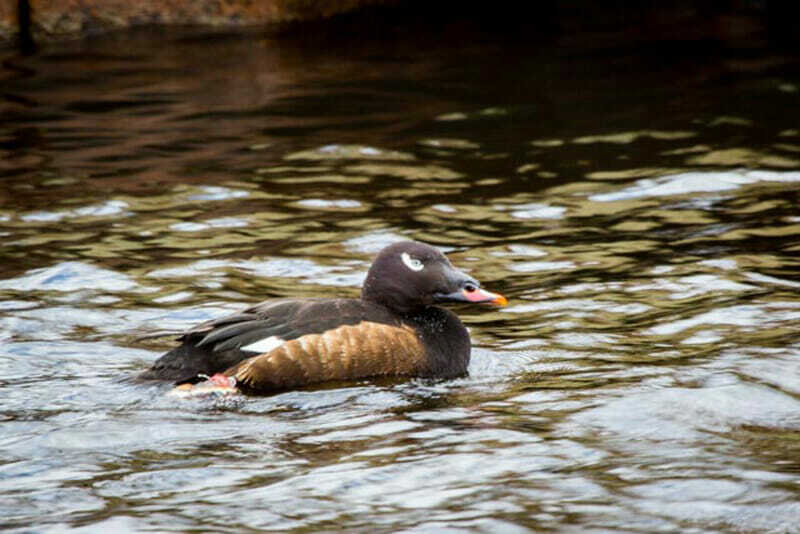 Harbors at Ludington, Manistee, Frankfort, Leland, and the Platte River Mouth – According to birding enthusiasts, these protected waterways draw deep water waterfowl and rarities such as scoters and eiders, shorebirds (including piping plovers)as well as gulls, terns, and raptors. Docks, piers, and public beaches provide good viewing locations for birders.